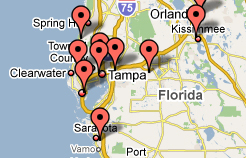 Tampa Bankruptcy Lawyers do all the work for you! Here at Clark & Washington, we understand that your situation has already caused you enough stress. This is why we have tailored our services to make a complicated and daunting process more manageable. Filing for bankruptcy in Tampa is a complex, life-altering decision. Our proven methods will help you navigate through this difficult time to a new beginning. We keep you informed and involved through every step of your filing. You should not have to wait to hear from your Tampa bankruptcy attorneys or constantly request updates. We take on the groundwork for your bankruptcy case so that you can focus your time and energy on other things. Your Bankruptcy is driven by documentation. We will handle every aspect of what the court requires to prepare your bankruptcy documentation. We know what the court needs and how they want to see it, from start to finish. You may be required to provide tax returns to the Tampa bankruptcy court. We know tax transcripts are often misplaced, lost and usually a pain to reproduce. We will relieve you of that extra stress by retrieving all your needed tax documents for you from the IRS. Depending on how complicated your case may be, you may have several court hearings. We have the resources to attend all court hearings. In many cases, we can handle these proceedings without you needing to be present. Credit counseling is required to file a Tampa bankruptcy. This can be a very tedious, time consuming task, to say the least. To facilitate this process, we have created resources for you to handle this right here in the office. Unlike other Tampa bankruptcy law firms, we will not send you away and expect you to go through this very important aspect of your Tampa bankruptcy case on your own. Your paralegal will walk you through the entire process to ensure you will have no future issues with credit counseling. Obtaining an accurate credit report is essential to your Tampa bankruptcy case. It can cost you additional fees to add any creditors that were missed after the initial filing. We charge a one–time fee ($20 single - $40 couple) to obtain your credit reports. This is not required but we highly recommend it. Free credit reports obtained elsewhere may not be as accurate. 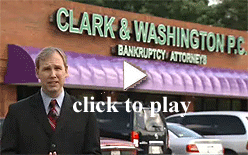 If you are ready to begin filing for bankruptcy in Tampa, Clark & Washington is ready to help. Give us a call at 813-345-5954 to speak to a Tampa bankruptcy attorney and get started on your case.